One of the most common questions we are asked is where to eat near the Monorail platforms. We want to share some of our favorite local places to grab a bite to eat. 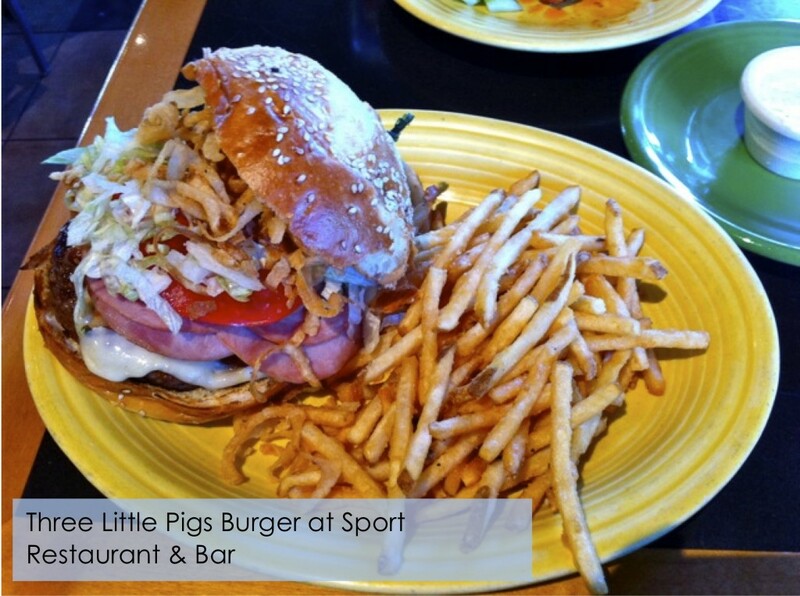 We LOVE eating at Sport Restaurant and Bar. It’s located at 140 4th Avenue North Seattle, WA 98109 – across the street from the Space Needle. This place has wonderful happy hour, great burgers, and awesome pizza! It’s a fun, family-friendly restaurant that’s run by local chef, John Howie. Click here to see their website. BIG fans of Pie, a brand new restaurant located inside the Armory on Seattle Center campus (305 Harrison Street, Seattle, WA 98109). Pie features incredible hand-crafted sweet and savory pies that are baked daily. Some of our favorite types of pie are raspberry peach, chicken pot pie, English meat and strawberry rhubarb. Click here to see their website. If you’re in Pioneer Square, one of our favorite places is Fado Irish Pub and Restaurant located at 801 1st Ave, Seattle, WA 98104. They have a great happy hour. 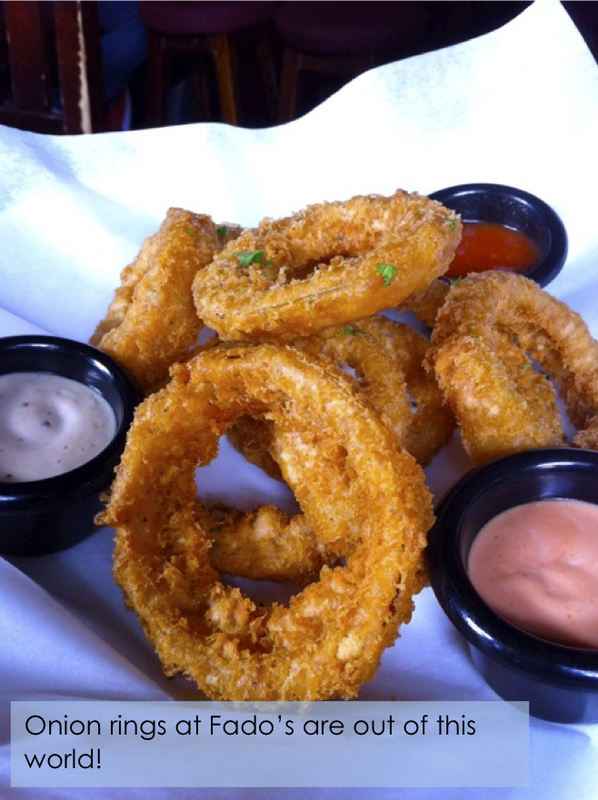 Our favorite dishes are their onion rings, curried chicken salad bites and blackened fish tacos. YUM! Click here to see their website. 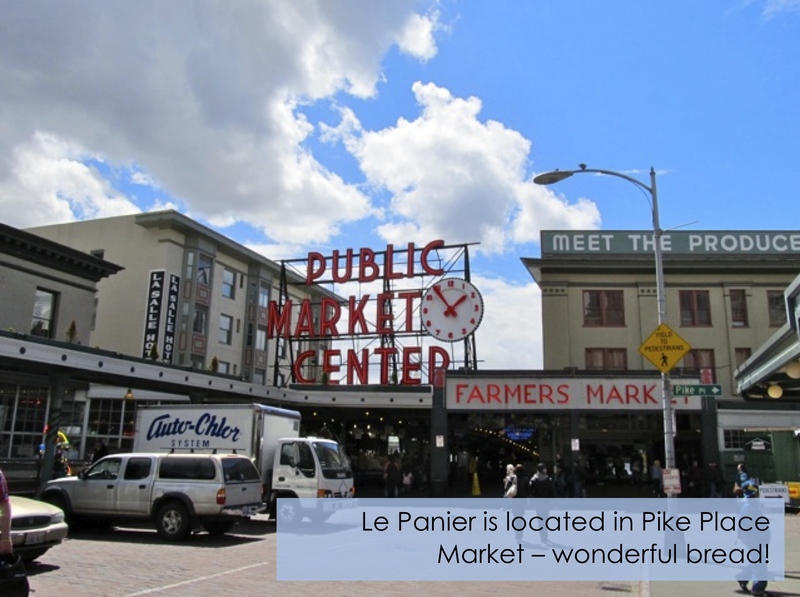 Le Panier at Pike Place Market is a wonderful french bakery that has incredible pastries and sandwiches. It’s located at 1902 Pike Place, Seattle, WA 98101. Their bread is to die for! Click here to see their website. 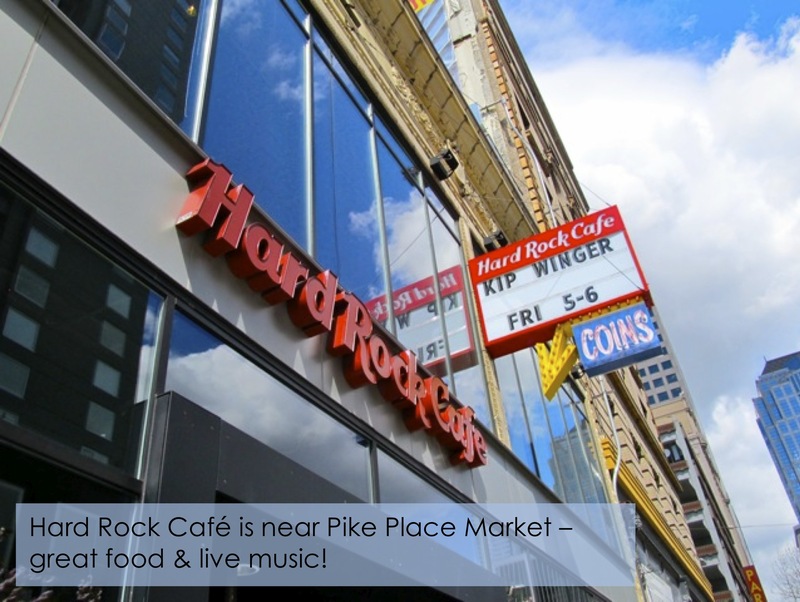 The Hard Rock Cafe is just a few blocks away from our Westlake Center platform in Downtown Seattle. It is located at 116 Pike Street, Seattle, WA 98101. The restaurant has historic artifacts and memorabilia as well as an outdoor terrace that overlooks Pike Place Market with fire pits and plenty of seating. Click here to see their website. 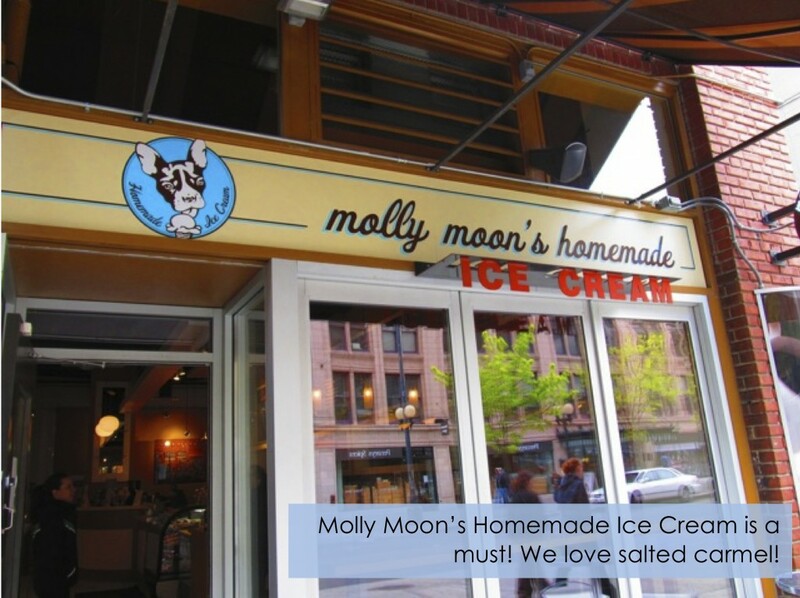 Molly Moon Ice Cream is a local company that features homemade ice cream with local ingredients. Their seasonal flavors are unique and refreshing. Our favorites are Theo Chocolate, Salted Caramel, and Honey Lavender. Delicious! They have several locations including one downtown on Pine Street near the Monorail platform. Click here to see their website. Lola is a Tom Douglas Restaurant that has, in our opinion, the best brunch in town. It’s located at 2000 4th Avenue, Seattle, WA 98121 at the corner of 4th and Virginia – easy walking distance from the Monorail’s downtown platform. It has a Mediterranean/North African twist to it – we love it! Here’s a link to their website. Seattle Center Monorail is a fast, direct way to travel between downtown Seattle and Seattle Center. It is open daily – the train departs approximately every 10 minutes. The Monorail platform downtown is located on the third floor of Westlake Center (5th and Pine Street). The Monorail platform at Seattle Center is adjacent to the Space Needle. We created a list on FourSquare that lists some of our recommendations for places to eat near the Monorail. Here’s a link to the list. There is a great article by The Seattle Times that focuses on where you should take guests to eat in Seattle. Click here to read the article.